Slow Cooker Low-Carb Mexican Lasagna Casserole can really scratch that Mexican food itch when you have one. And this sounds tasty for a Taco Tuesday dinner or Super Bowl Party Food! On Mondays we indulge our love of Mexican food and suggest ideas you might want to make for a Taco Tuesday dinner the next day. And maybe I am stretching it a bit by calling Mexican Lasagna a Taco Tuesday dinner, but I say anything with Mexican flavors sounds good on Tuesdays! And I bet this Slow Cooker Low-Carb Mexican Lasagna Casserole would disappear pretty quickly at a Super Bowl Party as well! If you don’t have the Casserole Crock that I used for this recipe, you can make it in any large oval slow cooker, it just won’t look quite as good. And it is the use of low-carb tortillas that makes this a low-carb recipe, so if you don’t care about that, just use any sturdy flour tortillas instead. Enjoy! This recipe was inspired by the Low-Carb Slow Cooker Sour Cream Chicken Enchiladas that I’ve also featured here, and after I made that one, the idea for Slow Cooker Low-Carb Mexican Lasagna Casserole popped into my head! The Mexican lasagna has seasoned ground beef that’s cooked with spicy tomatoes and salsa and layered with low-carb tortillas, cottage cheese, and cheese, similar to the way you’d layer lasagna. I made both these recipes in the Crock-Pot Casserole Crock Slow Cooker that has been so fun to experiment with! I tested both these recipes when my brother Rand was staying with me, and he couldn’t get enough of them, and both have been a hit on Kalyn’s Kitchen. And it’s only the use of low-carb tortillas that makes both those recipes low-carb, so if low-carb eating is not your thing, go ahead and use any tortillas you prefer. Get the complete recipe for Slow Cooker Low-Carb Mexican Lasagna Casserole from Kalyn’s Kitchen. I used the Crock-Pot Casserole Crock Slow Cooker for this recipe, but you can also make it in a large oval slow cooker if that’s what you have, it just won’t look quite so much like lasagna! Want More Slow Cooker Casserole Ideas? 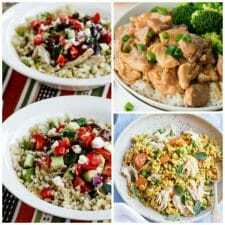 Visit the Index Page for Casserole Recipes to see all the Slow Cooker or Pressure Cooker Casserole Recipes that have been featured on this site.